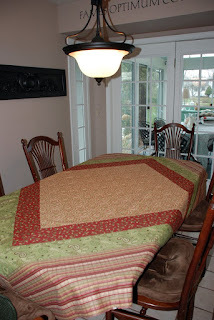 Yesterday, I finally tackled sewing a new tablecloth for the kitchen. 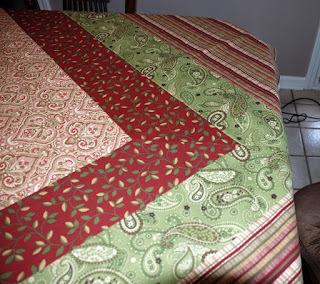 The old one which I loved was a quilted French style cloth from Williams Sonoma. I bought two of them on sale a few years ago. The green one is still in great shape and I use it on the porch table. The other one, has been washed a lot and is showing its age. It was a beautiful shade of soft terracotta and cream and I always placed it on the table diagonally. You can spot a little of it here. A few weeks ago I purchased some home dec fabric on sale in cotton, that I have had great success with, using for dishcloths, aprons, and pot holders. The fabric washes and dries without wrinkles and has a nice soft hand. I especially love the aprons. I picked out five different patterns that coordinated nicely. When I had measured the old cloth I was very surprised at how much yardage this was going to take. Now, I was beginning to understand why these tablecloths are $150+ at Williams Sonoma! In total I bought about nine yards! Of course there is some left over, but in order to get continuous strips I needed the length. I will probably need to purchase more of the strip for the backing, since I am using it for the binding as well. Did I mention that it has mitered corners? Mr B. as always helped with the "high" math. Something about the pythagorean theory, blah, blah, blah, just tell me how long I need to cut these strips. This is exactly why we are such a great team. I draw it out on a cocktail napkin when we are out to dinner, and he makes engineering plans later! Many times I hear, it won't work that way...but he always finds a way. Anyhow, now I have nine yards of fabric, measurements and a plan. My tablecloth will be a square (unlike the old one which was a rectangle) of 78 inches. I chose a square because I want it to lay diagonally (just like my limestone tile, that I love!). Here is the completed top. The mitered corners were a challenge, but I got the hang of it. They don't look too bad! I spent two days on the project because I have learned to stop when I get tired. It is so much better to finish up on a fresh day. Today, I will making the binding...yards and yards of it. I will use this tutorial from Pink Chalk Studio on double french binding. Oh boy, more "high" math...Mr B.? I will also piece the backing. Next comes the quilting, no, I am not completely out of my mind. My daughter has a friend who is willing to do this part for me on a long arm machine. Phew! It will then be ready for me to bind, by machine and hand. Ready to plunk down your $150 yet?